~ Complex in its simplicity, Love the foundational and driving force of all. A full existence in this world may only be reached when we understand love. Love inspires the Soul to greatness and fills the heart with a sense of purpose. Love really is the answer. Look upon what you have done, what you are doing and what you will do in this lifetime through the lens of universal love and be aware of the power of love as a tool to lift and support your greater purpose. 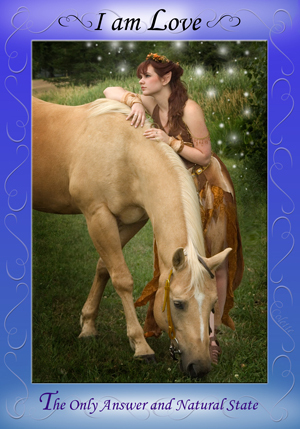 Insights ~ This is one of the cards that comes up quite often when I am doing card readings for women. It seems to me that the percentage of times it comes up, including for myself in my own readings, indicates the deep need for us to be reminded to love ourselves. Yes we love others, nurture and care for them, make sure they have what they need but more often then not we do not extend that same amount of attention to ourselves. When this card comes up it triggers for me to ask “what have you done for yourself lately?” and usually the answer is “not much”. There is a strong association between self-love and being content in your life… male or female… we forget much too often the importance of caring for Number One or even appreciating who we are and how far we have come along the way. We have gifts and wisdom that we share with others and it seems to me to be a bit of a shame that we forget to extend this wisdom to ourselves now and again. Self aware and self caring is not selfishness… it is a MUST if we are to become the shining light we are destined to be. No one else can give this to us. No relationship is complete unless we also love ourselves in the participation of loving others. It is possible to exist without love but not a pleasant place to exist in so I say: Love yourself and be joyful in what you have in your life even if you are not completely at your destination in regards to your life goals. Enjoy the process. Spend this week looking through the eyes of love, especially when looking in the mirror, and be kind to yourself. You are worth it!